What Your Child Needs to Know Before Kindergarten - I Can Teach My Child! Kindergarten is a scary transition for kids and adults alike. Nearly every parent wonders, “Is my child ready?” I’m quite certain almost every parent has googled “what your child needs to know before kindergarten” at one time or another. No matter where you choose to educate your child, we all want to be assured that our kiddos are where they need to be physically, cognitively, and emotionally. A few years ago, I wrote a post titled 71 Things Your Child Needs to Know Before Kindergarten. To say this post has been controversial would be an understatement. Never have I shared a post that has garnered such attention, both positive and negative, with over 1,000 comments. Honestly, as the years have progressed, I have found myself somewhere between the two camps. Research tells us that the brain development in a child’s first 6 years of life far exceeds any other time in life. Because of this, it is important to harness this time to engage kids in learning to love learning. But as a mom, I have seen all too well how quickly our children grow up. I don’t want to put unnecessary pressure on them to “achieve” by insisting on drill-and-practice or worksheets. I do, however, want to encourage a life-long love for learning by encouraging creative play and interest-based learning. I believe it is possible to prepare your child for kindergarten through play, real-life experiences, and simple conversations with your child. I decided, along with my friend Becky from Your Modern Family, to explore the topic in more depth in an ebook. I am super excited about our brand new eBook (Kindle and paperback version here) where we share both our experiences as teachers and as parents. Not only that, but Becky is also a play therapist! We have seen both sides of the coin and we are confident that the tips we provide in this book will help your child be realistically prepared for starting school (no matter where you choose to school him) with virtually no stress for either you OR your child. Written by teachers and moms: Both Becky and I are former teachers and now moms to children of multiple ages. We have a realistic perspective on both sides of the coin. 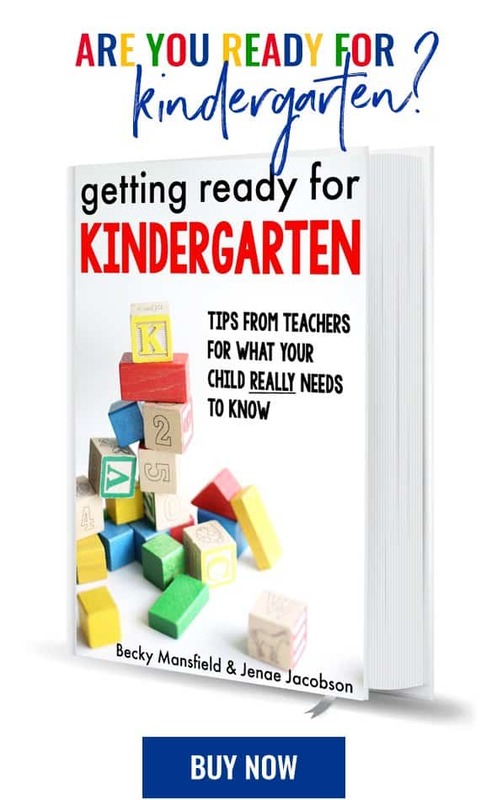 Includes the Building Blocks of Kindergarten: We have laid out 47 “building blocks”, or skills, that we feel are important for your child to have experience with before starting kindergarten. Your child’s developmental block tower will have a different shape and order than my child’s or your neighbor’s, but everyone is working towards the goal of encouraging kids to love learning and to be successful. Sometimes our blocks will be sideways or scattered, but they still provide a necessary foundation for future learning. Emphasizes all Aspects of Development: Social and self-help development are of equal importance to number recognition and pre-reading skills. We look at the whole child, not just school subjects. Includes Common Sense Tips: This is not a workbook, rather this book is chock full of real-life, hands-on common sense tips for moms and dads. We have included a few printables in the appendix of the book, but the majority of the book is simple ways to engage with your kids through play and real-world experiences. For a limited time, get this ebook for just $9.99! You can also get the Kindle version for $9.99 or the paperback version for $14.99! This article is very very helpful for me! Fantastic post ! Useful !